What for did you download MapsScout? If you downloaded it to help you with directions or help you look up maps, you must be disappointed. Although the word “maps” is in the name, the application has nothing to do with actual maps. In fact, the only thing it is capable of doing is showing advertisements. This is not entirely surprising, considering that the description on the Chrome web store informs that the application is meant to show ads based on your own browsing data. Did you download the extension from chrome.google.com/webstore/detail/mapsscout-advertising-off/fjclfmhapndgeabdcikbhemimpijpnah? It is unlikely that you have. It is also unlikely that you have downloaded the PUP (potentially unwanted program) onto Internet Explorer and Firefox browsers via mapsscout.com. Though these sources exist, our research team concludes that most users acquire it via third-party installers, bundled with other programs. In this report, we show how to delete MapsScout from your operating system. Unfortunately, we cannot guarantee that this is the only threat that requires removal. Regardless of how you downloaded MapsScout onto your browser and operating system, it is a good idea to inspect your operating system with a trusted malware scanner. Don’t know where to find one? Click the Download button below. This scanner is free and up-to-date, and so you can use it to find even the most recent infections. You must not ignore the possibility that other things besides the PUP exist because you do not want to give any time for malicious parties to exploit you and your system’s vulnerability. Needless to say, it is hard to discuss other threats when we cannot identify them, which is why we focus on the suspicious MapsScout for the remainder of this report. As mentioned already, it works as an advertising tool. If you install it, you will start seeing ads wherever you go. Whether you visit shopping-related sites, social media sites, or random pages, you are likely to find little banner and in-text ads. You might also face pop-ups and interstitial ads. Whenever you face ads, you should become suspicious. Of course, if you let the PUP in knowingly that it can show ads, it might take some time before you realize that it is best to remove it. 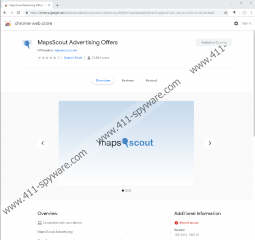 The full name of the PUP is “MapsScout Advertising Offers,” and that indicates that the extension is all about showcasing ads that serve as offers. It is known that the extension tracks/monitors the activity of the user, and that is not something you can ignore. The fact that all your virtual activity is monitored by someone who is interested in nothing else but pushing advertisements suggests that ads are created based on information that is gathered. This is not good news. Although it would seem as if more personalized ads are more beneficial, the reality is that you are more likely to click on them. That is it, and that is, most likely, all that the creator of the PUP needs to earn money. If they care about nothing but money, it is possible that they do not even care if the ads belong to malicious parties. Of course, that is just a theory, and we do not have proof that malicious ads are served by the PUP; however, that certainly is something you should consider when deciding whether or not you should remove MapsScout. Our research team has created a short guide that explains how to delete MapsScout from the most popular web browsers. Note that Chrome and Firefox users need to use an entirely different method than those using Internet Explorer because the PUP is installed as an application for the users of the latter. If you need help removing MapsScout from your operating system, you also can install anti-malware software. If you do this, you will not need to worry about clearing browsers, deleting other potentially active threats, or even protecting your operating system against malware in the future. Hopefully, you now know what to do, but if you have any questions about the removal process, do not hesitate to communicate with us via the comments section. Access the Control Panel menu on Windows. Right-click the unwanted application and choose Uninstall. Open the browser and tap keys Ctrl+Shift+Delete. Mark the boxes and click Delete. Move the cursor over to More tools and then click Extensions. Choose the time range, mark the boxes, and click Clear data. In the Tools menu click Add-ons. Choose the time range, mark the boxes, and click Clear Now.